TORONTO -- It took 17 years, but the Toronto Raptors' woeful Game 1 losing streak is over. 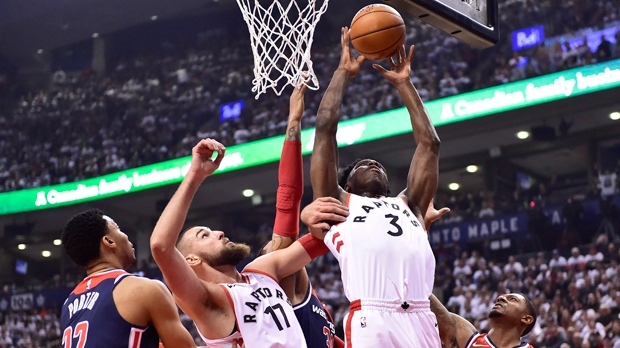 Serge Ibaka scored 23 points and had 12 rebounds, while DeMar DeRozan added 17 points and six assists, and the Raptors beat the Washington Wizards 114-106 in Saturday's Game 1 of the Eastern Conference playoffs. It is the first time the Raptors have won a playoff opener since 2001. Delon Wright had 18 points, while rookie OG Anunoby and C.J. Miles scored 12 apiece, and Kyle Lowry finished with 11 points and nine assists for the Raptors, who were missing backup guard Fred VanVleet, who bruised his shoulder Wednesday in Miami. John Wall had 21 points and 15 assists to lead Washington, while Markieff Morris added 22 points and 11 rebounds, and Bradley Beal finished with 19. The Raptors had the unfortunate league record for consecutive Game 1 losses -- 10 -- and had dropped all but one of the 13 previous playoff openers, beating Philadelphia in the second round in 2001. Intent on ending the streak Lowry, said the team's approach was: "Our Game 1 is our Game 7." The Raptors held an early 10-point lead against their eighth-seeded opponents, but the rest of the night was a scrappy back-and-forth affair. And when Toronto went into the fourth quarter with an 86-85 lead, it set up a thrilling final 12 minutes in front of a capacity Air Canada Centre crowd that included Drake, sitting courtside in a Humboldt Broncos hockey jersey. The teams battled virtually basket for basket before Miles drilled a three -- to an ear-splitting roar from the crowd -- with 6:28 to play that put Toronto up by five points. A referees' review then disallowed an earlier Mike Scott basket (released after the shot clock), and then Lowry scored, and suddenly it was a nine-point Raptors lead with just over five minutes left. A beautiful series of passing led to a three-pointer by Wright with 3:31 to play, and gave the Raptors a 12-point lead. Then, with the white-clad crowd on its feet, Lowry found Ibaka for a dunk with 1:42 to play, sealing the victory for Toronto. There were numerous positive signs in the win, including Toronto's three-point shooting. After getting badly outshot by Cleveland in last season's playoffs, they made it a focus this season, and Saturday they shot 16-for-30 from beyond the arc. Anunoby showed no rookie jitters in his playoff debut, a positive sign for the rest of this playoff run. "We call him an old-head rookie now so we have to treat him that way," coach Dwane Casey had said in his pre-game press conference. Miles, who was acquired last summer for his lethal long-range shot, lived up to his billing, going 4-for-7 from long distance. The Raptors lost just seven home games in the regular season en route to a franchise-high 59 wins, and earned the No. 1 seed for the first time in history. They split their four games with Washington in the regular season, but the Wizards were without Wall for all four. He returned on March 31 after missing much of the season with a knee injury. A leaky roof delayed the start time by five minutes while officials met to determine whether the court was safe. An arena staffer dashed onto the court with a towel throughout the game. The storm also closed "Jurassic Park" -- or Maple Leaf Square -- where thousands of fans traditionally congregate to watch the game on the big screen outside the ACC. Anunoby scored eight points in eight minutes to lead the first-quarter charge, and his putback layup put Toronto up by 10 points just four minutes into the game. But their double-digit lead was shortlived and the Raptors led 28-23 after one. Jakob Poeltl's alley-oop midway through the second made it an eight-point Raptors lead, but a 13-0 Wizards run gave the visitors a five-point lead. Washington went into the halftime break with a 59-55 advantage. DeRozan had 12 points in a third quarter that saw neither team lead by more than five points. The Raptors' seven threes in the first half were a franchise playoff record. Game 2 is Tuesday in Toronto then the series heads to Washington for Game 3 on Friday and Game 4 on Saturday.